The day before LeAnn Rimes releases her Re-Imagined EP, a collection putting unique new spins on some of her best-known songs, the country-pop powerhouse unleashes another surprise track from the collection. And this one comes with a bona fide rock superstar attached. Stevie Nicks, whose work as a solo artist ands as a member of Fleetwood Mac have influenced Rimes for decades, joins her on an updated rendition of "Borrowed," a track originally featured on Rimes' brilliant, yet underappreciated, 2013 LP Spitfire. Written by Rimes with Darrell Brown and Dan Wilson, and produced by Rimes, Brown and Nicks with famed guitarist Waddy Wachtel, this updated version of "Borrowed" finds the two singers sharing melody and harmony, imbuing the tune with emotional depth yet never overpowering each other. The result is a bittersweet country ballad with just a touch of glittering pop-rock magic. Nicks, who refers to the "How Do I Live" singer as "the best I have ever sung with," notes that she chose to record "Borrowed" for Re-Imagined after Rimes sang it on The Tonight Show in 2013. "I stopped in my tracks and sat down on the floor and started to cry," the rock icon tells Rolling Stone. "I understood what she was singing about. I understood that the pain was real... and I understood that it had happened to me. When the song ended, I called my assistant to tell her that one day, I would sing this song with LeAnn. It was our destiny." Nicks, a member of the Rock and Roll Hall of Fame with her Fleetwood Mac cohorts, says of Rimes as a vocalist, "You can't compete with her; you can only keep up with her. To sing with her is to be blessed. She teaches you; she takes you along for the ride. She takes you on her journey and you arrive a much better singer." 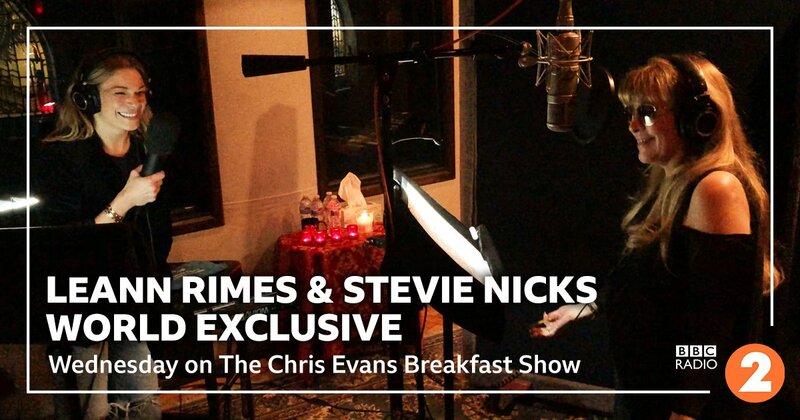 "Stevie has been inspiring me as a songwriter and performer since I can remember," adds Rimes. "To know that my music has seeped its way into her heart the way her music has into mine is magical. Connecting with her, not only musically, but on a soul level – understanding what it's like to be a woman with passion, a pen and a desire to tell the most authentic, heartfelt truth through song, has been an experience that's forever left an imprint on my life." The Re-Imagined EP, also featuring newly crafted versions of such Rimes hits as "Blue," "How Do I Live" and "Can't Fight the Moonlight," is available June 20th. Check out their interview on Wednesday on BBC Radio 2 in the UK after the 8am hour. This is wonderful except Stevie's voice is mixed too low in comparison to LeAnn's. I wish you could hear Stevie a little more.